Dr Graham Bird: SLTA Teacher of the Year 2017The sixth annual Student Led Teaching Awards ceremony was held recently and celebrated the high standard of teaching and pastoral support in Bangor University. Nominations have significantly increased over the last few years, which shows that more and more students are recognising the importance of the quality of teaching on their education. Of the 900 nominations, academics and non-academics were nominated for their hard work in the University over the 13 categories. This year there was an extra award for the School of the Year, which was awarded to the School of Environment, Natural Resources and Geography (SENRGy). “It was a fantastic night for SENRGy and great to see our staff and students being nominated for awards. Winning the School of the Year Award is further evidence of the great atmosphere within the School, the hard work of staff and students and the constructive relationship SENRGy has with its students." 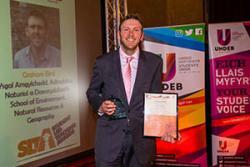 The School also saw one of its staff scoop the Teacher of the Year Award - Dr Graham Bird, Senior Lecturer. Dr Bird said: “It's a great honour to be nominated for the award, let alone win it. A huge thanks to the students who took the time to send in the nomination." More photos on Seren's Facebook page.